Our outfitter permits are on the Pike National Forest and Bureau of Land Management lands, Units 50, 500, & 501, in the South Park Ranger District. These are trophy draw units for elk, deer, antelope, moose, bighorn sheep & black bear. This limited draw provides the very best opportunity for bagging world class trophy animals. 49,50,500&501 are draw units with an April 1st application deadline. 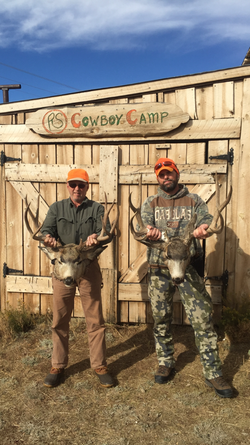 ​ Hunters are responsible for retrieving game, complying with game laws and having GPS and or maps to determine that they are hunting on public land and in the correct unit. Comfortable rustic cabins have fully equipped kitchens with bunk beds (bedding is not provided). Shared bath house with shower and toilet (no toiletries or towels provided). Cabins do not include: paper goods, trash bags, dish soap, Dish towels, dishwashers, condiments or spices or microwave. Fire wood is included and electricity is in each cabin. Kitchens are fully equipped with coffee maker, pots, pans & utensils. Fire pit area, game pole, meat shed, charcoal grills and fishing in private pond and creek is also included. Gold Metal designated fishing on nearby State Wildlife Areas, license required. Cabins, dishes and cookware must be left clean for the next group of hunters. All trash must be hauled out and bones, heads, hides etc. hauled to our bone yard South of the cabins. 0-1 preference points depending on the season and year is usually required to draw a Unit 50 license. Units 49, 500 & 501 may require 2 or more points depending on the season. Elk licenses are available to draw in all the big game seasons. Buck Deer licenses available to draw in the 2 , 3 & (4th in unit 501 only) rifle seasons as well as archery and muzzleloader seasons. Bear, antelope and Bighorn sheep draw only. 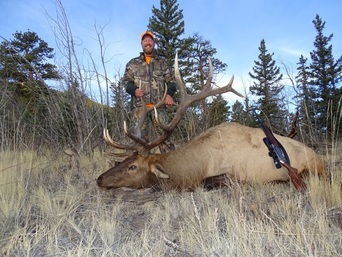 Over the counter elk licenses available in units 37 and 581 during the 2nd and 3rd rifle seasons only. Deer is draw state wide in all seasons. The ranch receives a limited amount of land owner vouchers that may be available for an additional fee. Other ranches in the area receive vouchers as well and are usually available for purchase.